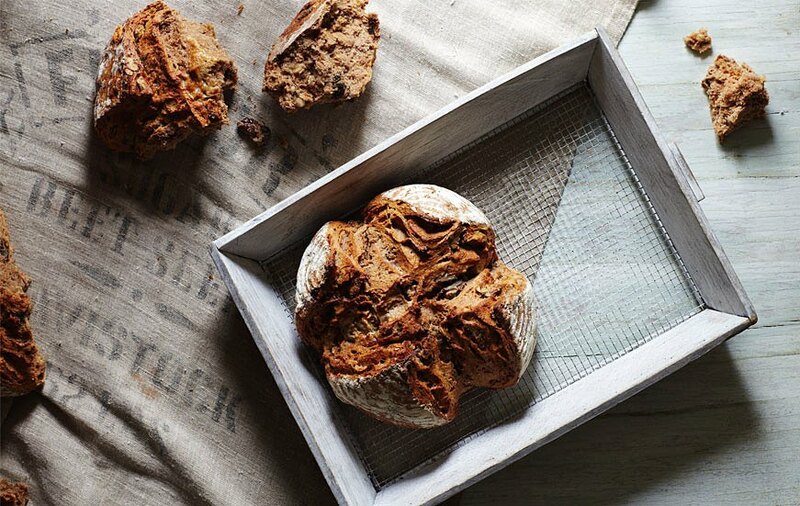 Sweet and savoury at the same time, with an incredible depth of flavour, this quick bread will certainly become a favourite with many of you. The slightly salty tang of the Stilton gives it real depth and perfectly balances the crunch of the walnuts. Preheat the oven to 200°C/400°F/Gas 6 and lightly oil a baking sheet. Put half the walnuts into a food processor and whiz until finely ground or crush using a mortar and pestle. Using your hands, break the other pile of walnuts into large, rough chunks. Put the honey in a small heatproof bowl set over a saucepan of gently simmering water to help loosen it. Add the buttermilk. Put the flour, bicarbonate of soda, salt and all the walnuts in a large bowl, stir to combine, then make a well in the centre. Add the honey and buttermilk mixture and mix together, using a wooden spoon, to a soft dough. Add the cubes of Stilton and stir to combine again. Don't overmix or the bread will be tough. Turn the dough out onto a lightly floured work surface, shape it into a round loaf and put on the prepared baking sheet. Slice a deep cross into the top of the bread, cutting almost right the way through to the baking sheet. Bake for 30-40 minutes until well risen and golden brown. Transfer to a wire rack to cool.